I’ve always been a bit myopic in my posts, especially this one. I have always sort of seen the value of the completed project over the path of creating it. I know that it is wrong, that one thing people search out is the process of creating, in addition to the beginning and end projects. I just haven’t been the best at doing it… and I am always trying to address it. I have several projects in the works, I talked about them in my previous posts. These particular projects have many steps, and often each step is but a few minutes and then waiting. Painting and waiting for it to dry. Staining and waiting for it to dry. Waiting for the staining and painting to attach the legs. Waiting to attach the legs so that the skirt can be attached. And it goes on and on. I’m sure you get the bigger picture. So, today seemed to be momentous. It seemed that real steps forward were taken and results achieved. Still not done yet, but we’re getting there. 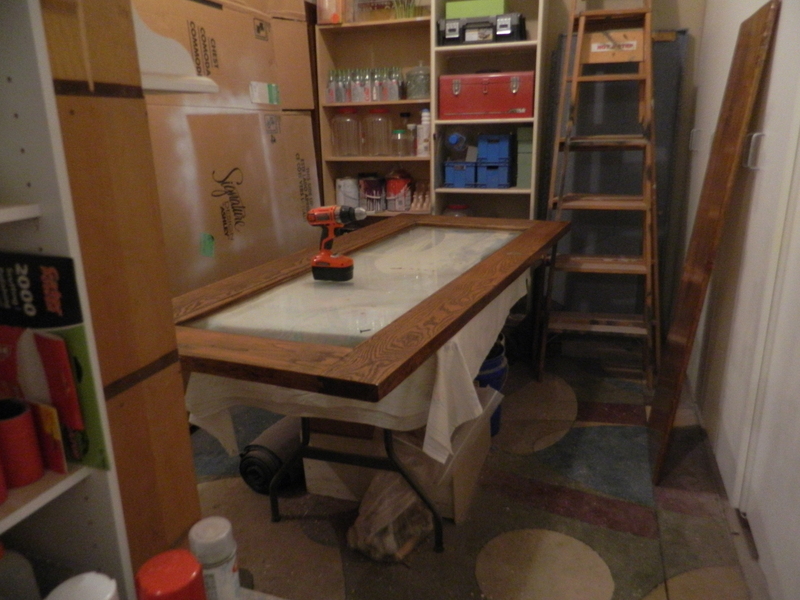 The door (for the dining table) has been stained and polyurethaned with two coats each. In between each coat is a light sanding. The coloring turned out gorgeous! (I am telling you, this particular project is going to be very hard for me to part with!) In this photo, you can see the underside of the door… I had to flip it over to finish – silly me, not thinking – since the door has a large piece of glass in the middle of it, you will be able to see through it! Duh! So, the table skirt also had to have more painting… again, not thinking! 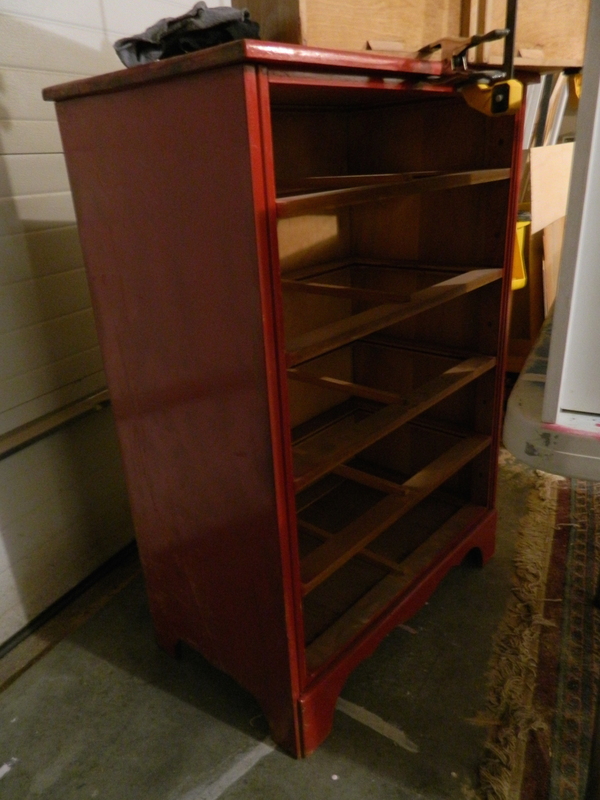 But the red against this deep stain color is just stunning! 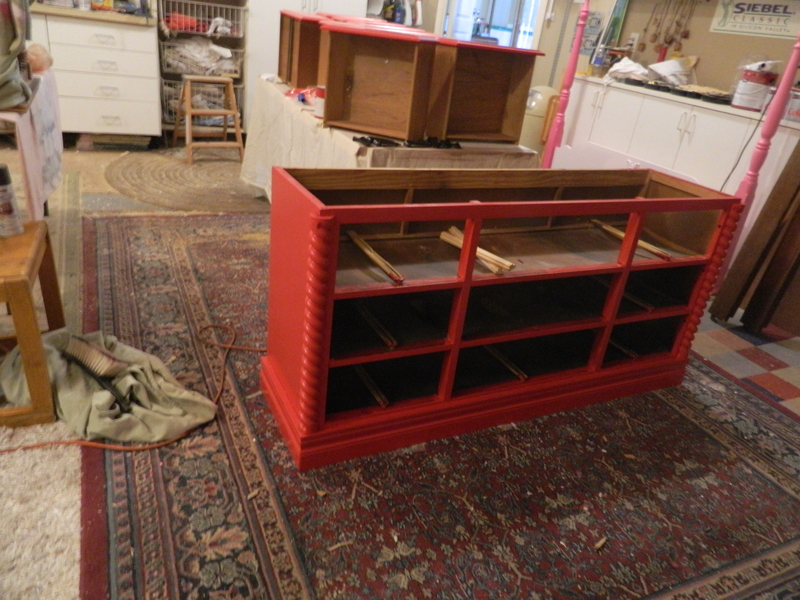 The top of the sideboard has gotten the same treatment, although because the type of wood differed from the door, it required an extra couple of steps and some experimenting to get the color to be the same. All in all, it turned out perfect! We moved the sideboard (sans top and drawers) into the garage. The drawers has all the previous holes filled as I’ve finally made a decision on what hardware is going to be used. 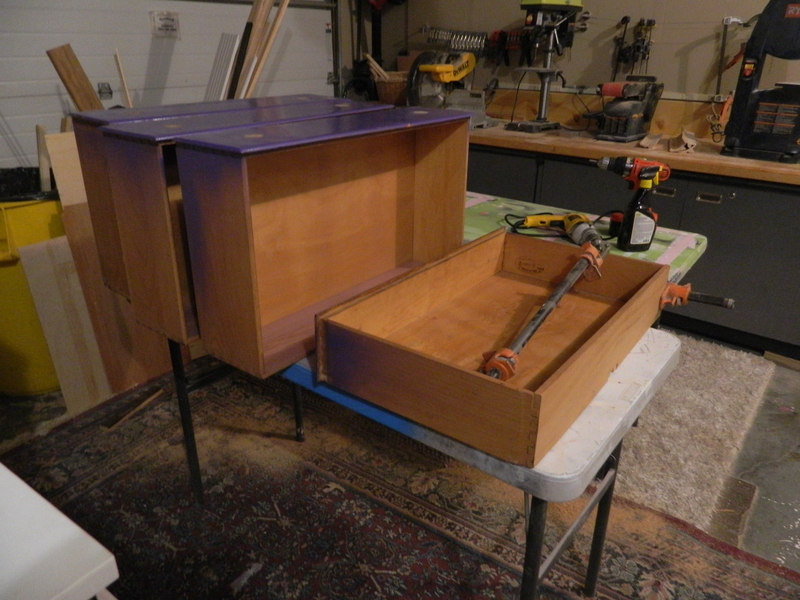 So, it took a little sanding and then re-priming and re-painting the drawer fronts. 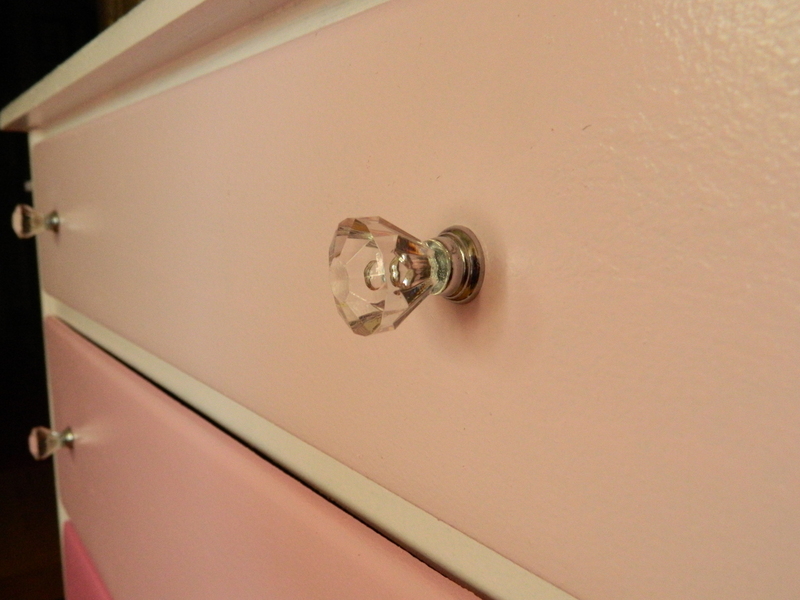 I cleaned and painted the hardware, which was salvaged from an old piece. I used a deep metallic brown that has just a hint of sparkle to it and I think it will be spectacular when we get it installed. It has a bit of a fifties flare, I think. 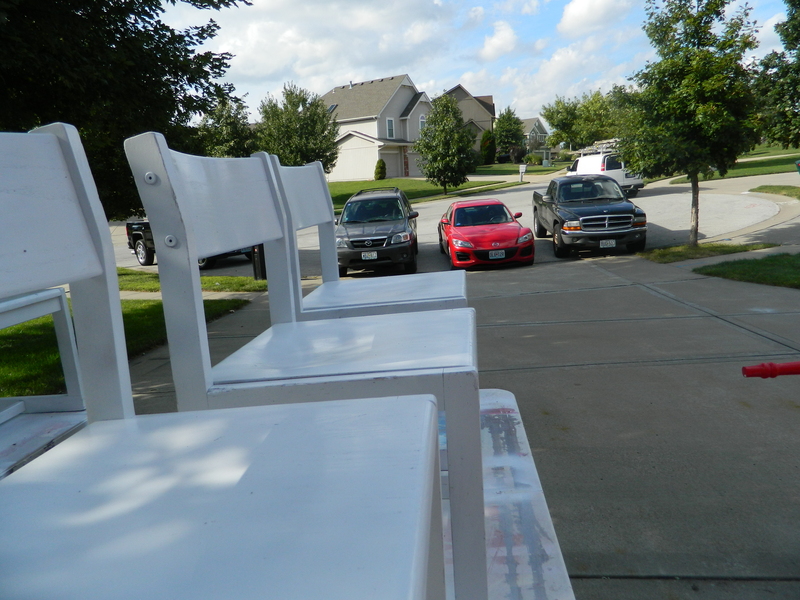 Next up, the six chairs have been moved onto the driveway so that I could complete the priming. The weather has been absolutely gorgeous and I wanted to take advantage of the sunshine and mild temperatures. The fresh air helps when doing all the painting as well. 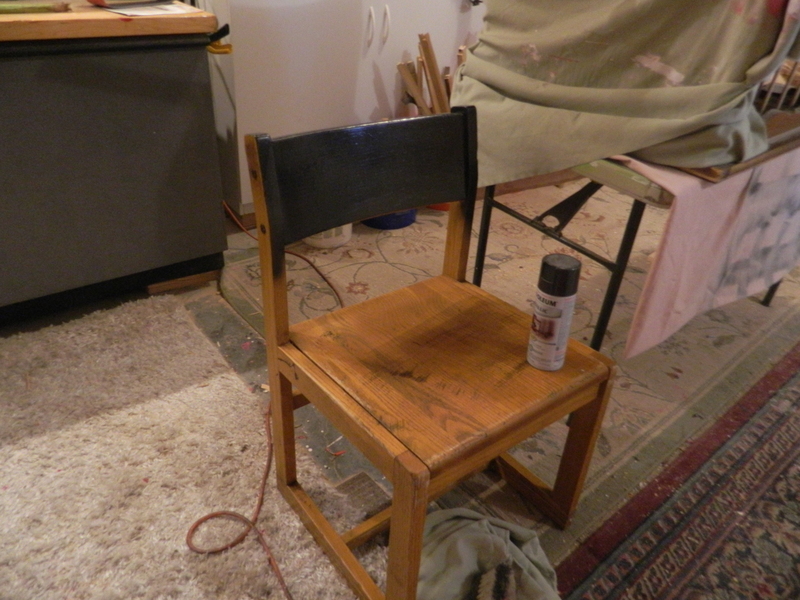 Six cans of premium white paint and the six chairs are finally ready for their color. Our neighbors to the right of us are having their house painted, so to protect our cars from overspray, we moved them down to the street. Thank heavens for the large circular semi-cul-de-sac that we live on, having them parked out there doesn’t interfere with traffic. Its almost too funny to think that when we bought a house with a three car garage, we thought we would actually park the vehicles in them! 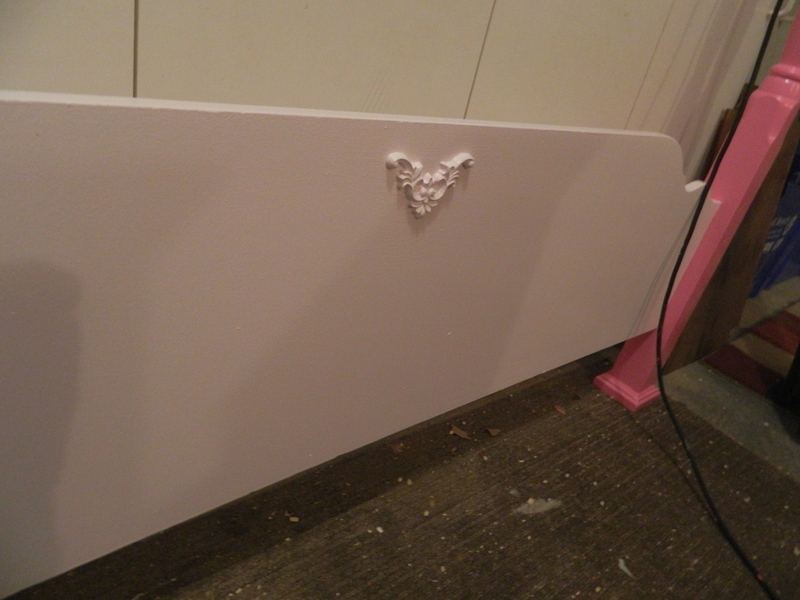 The wood appliques that I ordered online finally came so that I could finish the pink ombré head- and foot-boards. I like the appliques, but wasn’t paying close enough attention when I ordered them. I thought I was getting 7″ x 7″ but in reality they were 7 cm x 7 cm, so much smaller than I thought. But they are just enough and add that something special that I was looking for. Now to get the side boards done. 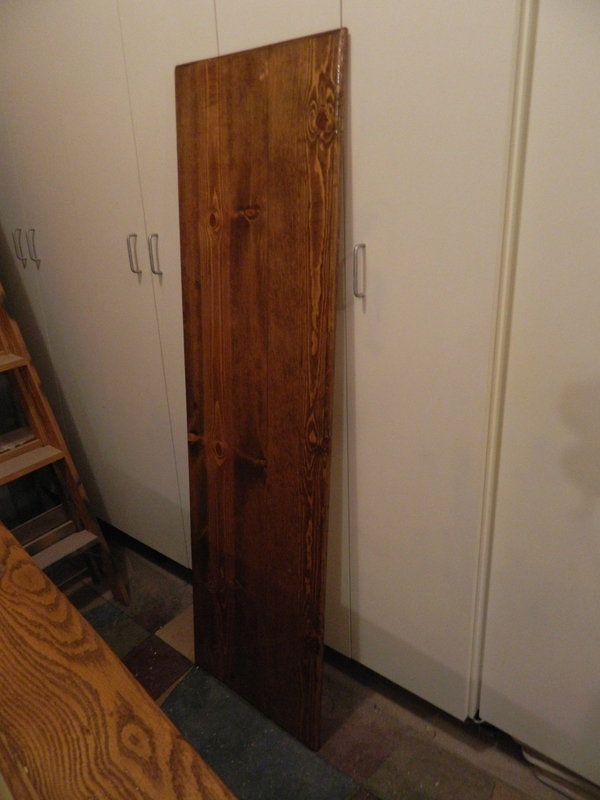 They actually came with a different head and foot board – I was just naive enough to think that they would work on any old antique bed frame. Nope! Different attachment mechanism entirely. Now I have to figure out if I can modify the ends of boards themselves or the connecting hardware in the bedframes. Sigh. Nothing ever seems to be easy. Something recently came across my desktop that indicated that one of my photographs that I have included in this blog had ended up on Pinterest without a link back to my site. That gave me some thought. I had started to design a logo that I could print across photos that I posted, but then I thought it would just mean more work for me to add the logo to each and every one of my photos. And if people love the work that I show and want to re-pin it, I say ‘go for it’. 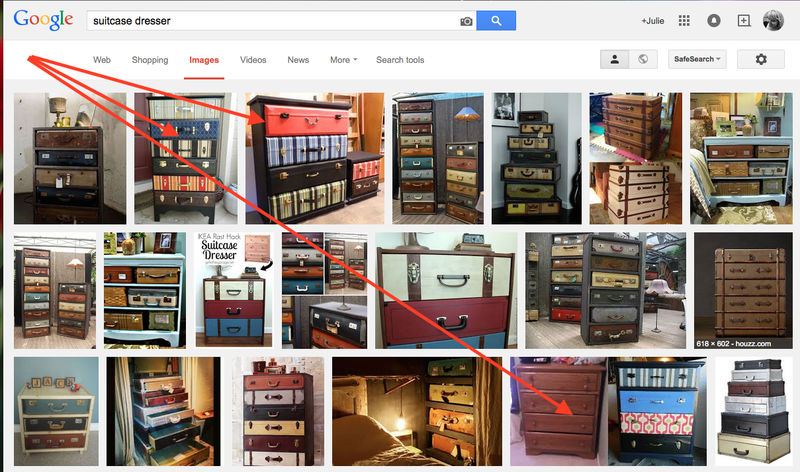 So my photos showed up three times in the first three rows. Woot! 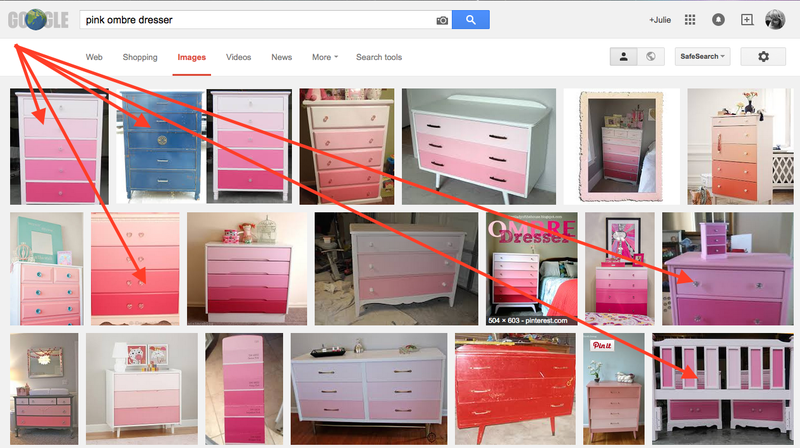 Next, I googled ‘pink ombre dresser’ and I was not only first and second, but appeared five times in the first three rows! So, back to actual projects! 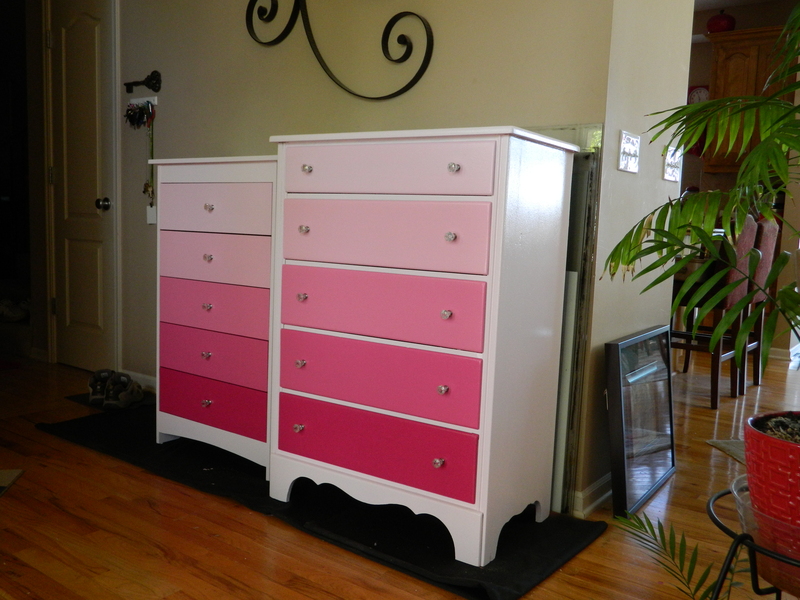 I did finish two more dressers, but to everyone’s credit, it isn’t very exciting. I’ve done this over and over and you know what? They are best sellers. They always are so adorable in any girl’s room, even if that girl isn’t so little! 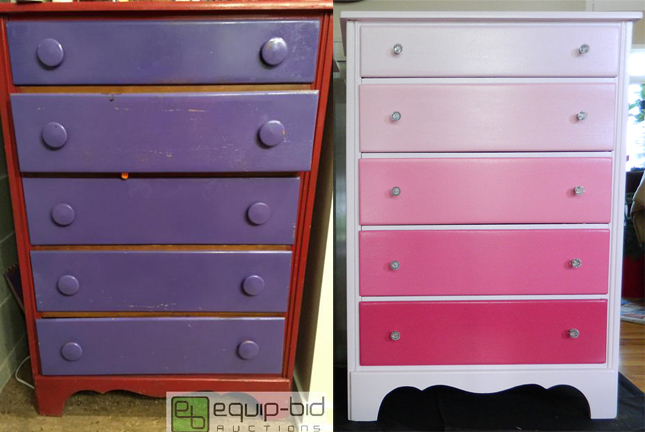 I had opted to paint a dresser that isn’t up to my normal standards, I had picked it up debating whether to try another style, but it turned out that the idea wasn’t going to work. 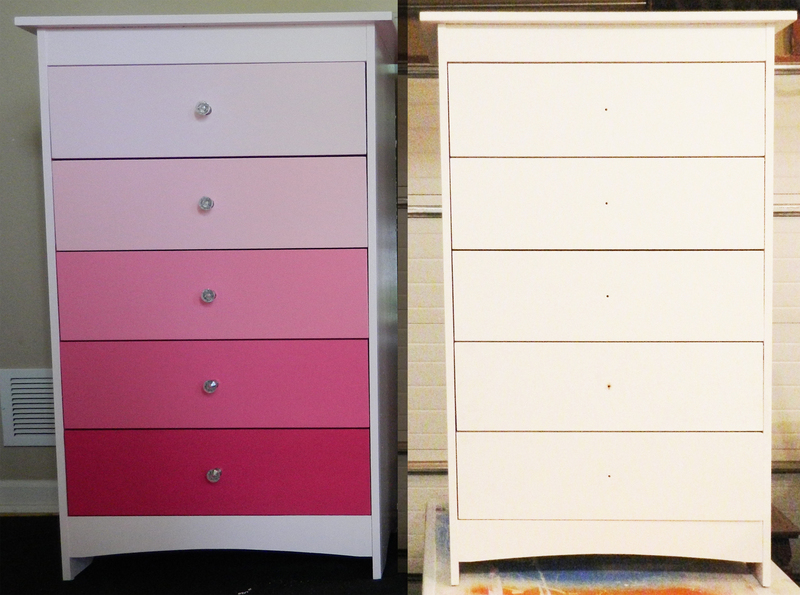 Since I was painting another dresser in the ombre style, I just did both at the same time. Apologies for the bad lighting, but we had just gotten the “jewelry” installed and was late in the afternoon. But you get the idea. It was pretty much rote painting and I got The Kid to help this time. Primed, two coats of paint and added the handles. Speaking of handles, I went online and ordered some new handles. I thought that they were a little bigger in diameter, but they are pretty. And they are appropriate for the intended buyers. You can see that I actually have been getting pieces from a local auction site. They are sporadic as far as including furniture, but when they do, its pretty good quality stuff. Most of the pieces need some TLC when we pick them up. 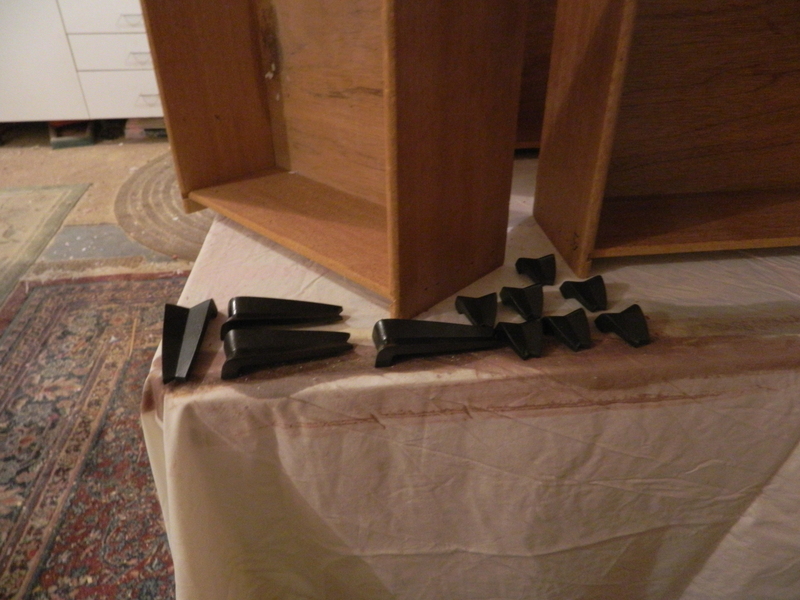 Drawers need strengthening and re-glued. Some pieces almost need to be rebuilt, all of them needed sanding and spot repairs. But when the bones are good, it is worth it. So, they we are. Next up is to finish the two benches we’ve been working on. 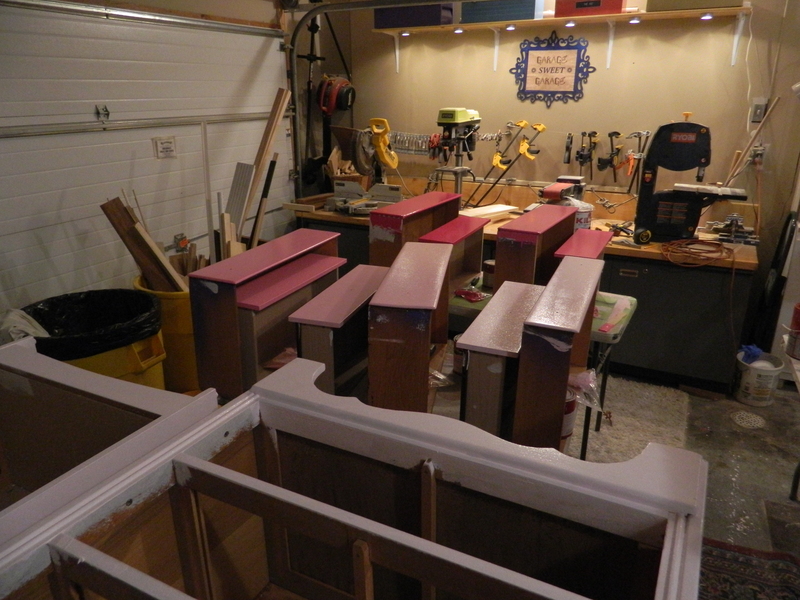 They are being built using two sets of head and foot boards and painted red with stained seats. 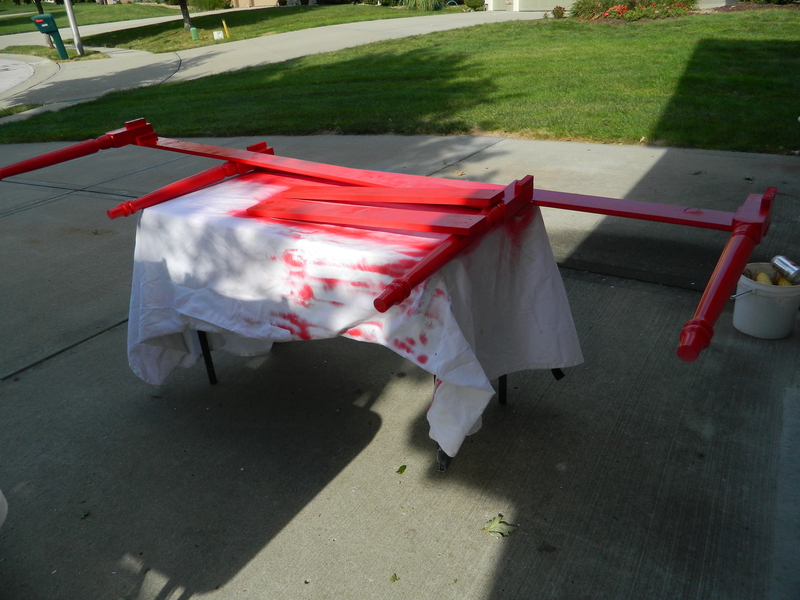 I absolutely hate working with red paint – not for the color itself, but for whatever reason this time, is requiring more coats of paint than anything I have done painted before. And I’ve done a lot of projects in red! 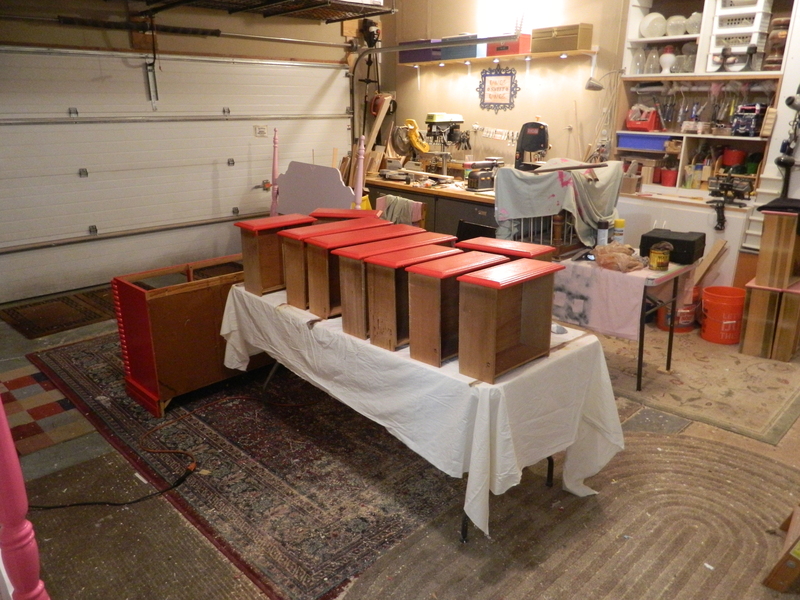 Just wanted to check in with everyone… The Kid and I have been busy starting a multitude of projects. The collection of furniture and projects is a never ending stream. I have a bug about the next “big one” – a project that will span a fair amount of time and cost more than most. It is a toss up between the master bedroom makeover or attempting to once more finish the attic space behind The Kid’s closet. Either way, both are slated to go done while I am taking a hiatus from work and have the time. 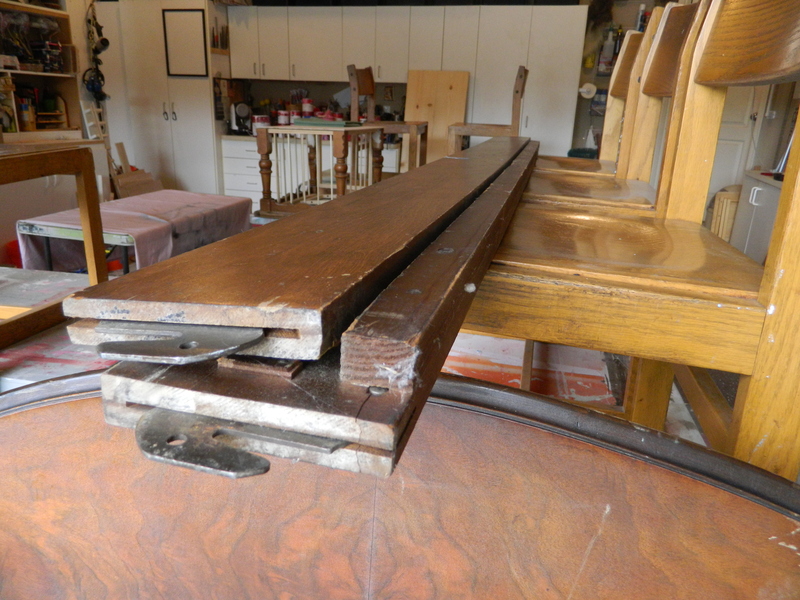 Today, we’re working on a couple of matching benches from head and foot boards. 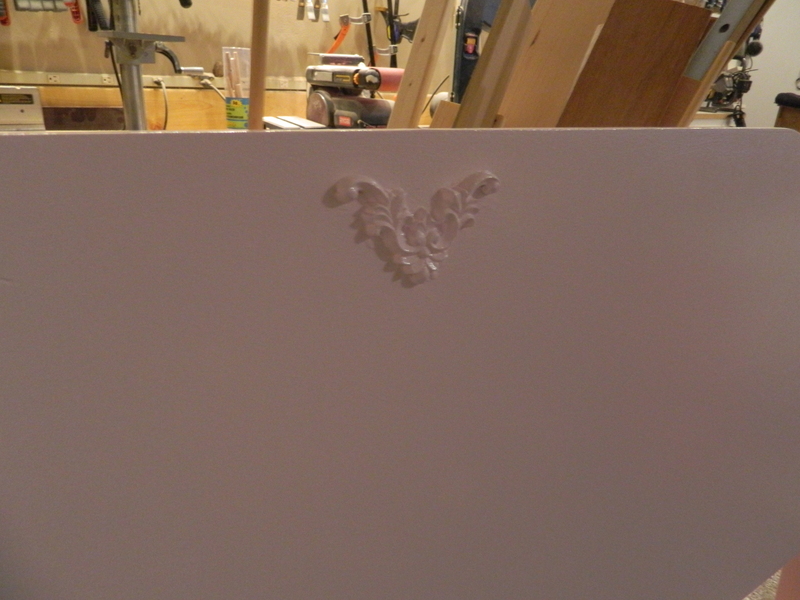 We also got started on my latest rescue, another five drawer dresser purchased at a local auction company. 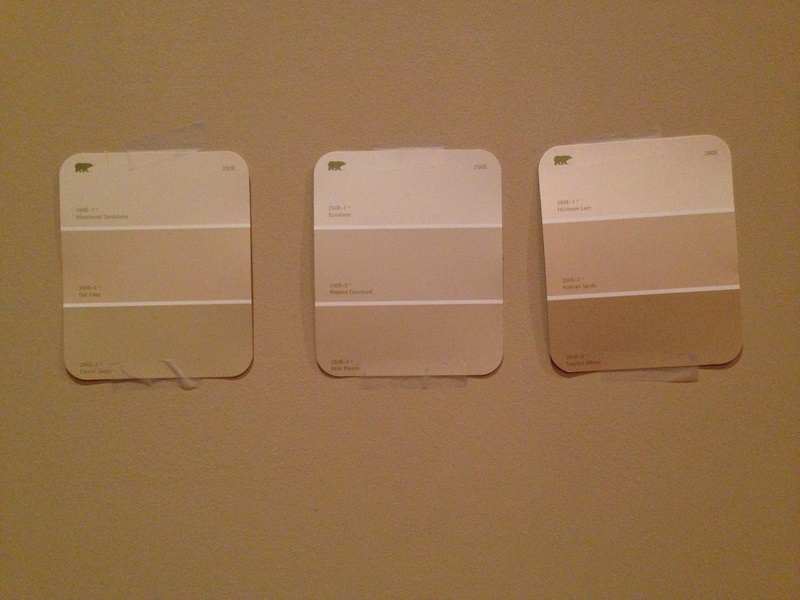 We also picked up a ton of paint chip cards, chose the color scheme for my master bedroom. Which one do you think matches best? The Kid thinks the middle one on the right, I think the bottom on the left. I am going to leave these up for a few days, look at them in different lights. We spent most of today, though, listing eBay auctions. I also spent some time up in my quilting room, finishing up the remainder of my quilt tops: matching the fronts with the backing material.I finished up the last of my denim quilts, but need to purchase some flannel for the backing. I love the combination of recycled denim and flannel – like wearing your favorite jeans and a flannel shirt. I just went through 16 yards of dark blue flannel getting five other quilts ready. Wow! I go in cycles, it seems, where for days, sometimes weeks, working on the same sort of projects and then suddenly due to acquiring materials, I will switch to something else. And then that, will consume my time for a few weeks. 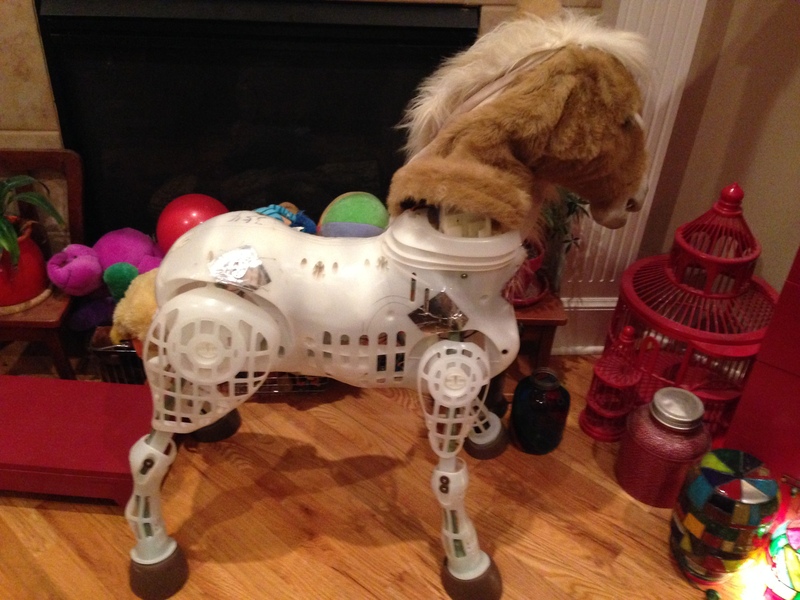 The furniture that The Kid and I work on is really to fund the other projects, so that sort of goes on all the time. At least a little bit all the time. Come back often for updates!